Join us as we enjoy a weekend full of sewing at our "Sleep in your own bed" Retreat. The fun starts on Friday, April 5th at noon, and continues until 2pm on Sunday, April 7th! There will be lots of fun, snacks, and great prizes (and of course, hours of sewing)! Note on Arrival Times: Due to a mastery class, we are unable to set up on Thursday of this week. We will need time the morning of the retreat for preparations to ensure everything is ready for our weekend of fun! See you at noon!! Payment is required at time of sign up to secure your spot. 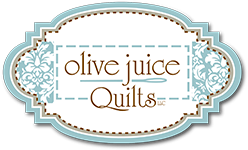 You can sign up and pay online, stop in or call Olive Juice Quilts at (608) 782-3257! Includes Breakfast Satuday morning, and Dinners on Friday and Saturday. Plus plenty of snacks and treats!